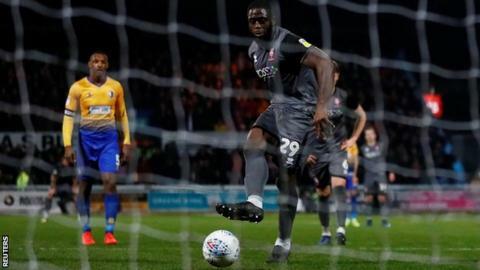 John Akinde's second-half penalty extended League Two leaders Lincoln City's unbeaten run to 15 games as they drew at third-placed Mansfield Town. Krystian Pearce headed the Stags ahead from a corner in the opening minutes before clearing off his own line. City should have levelled, but Michael Bostwick's 35th-minute goal-bound shot was blocked by teammate Harry Anderson. Stags keeper Conrad Logan clumsily fouled Anderson in the box to give away the penalty that Akinde calmly scored. The Imps extended their lead at the top of League Two to six points from second-placed Bury, while Mansfield go back into the final automatic promotion place ahead of MK Dons on goal difference. Danny and Nicky Cowley's Lincoln side have not lost a league game since a 2-1 defeat at Crewe on Boxing Day and now have a 10-point gap between themselves and fourth-placed MK Dons. Match ends, Mansfield Town 1, Lincoln City 1. Second Half ends, Mansfield Town 1, Lincoln City 1. Alexander MacDonald (Mansfield Town) wins a free kick in the defensive half. Substitution, Mansfield Town. Willem Tomlinson replaces Jacob Mellis. (Mansfield Town) wins a free kick in the defensive half. Attempt missed. Neal Eardley (Lincoln City) right footed shot from outside the box is high and wide to the left. Attempt saved. Bruno Andrade (Lincoln City) right footed shot from the centre of the box is saved in the centre of the goal. Matt Preston (Mansfield Town) is shown the yellow card for a bad foul. Foul by Matt Preston (Mansfield Town). Bruno Andrade (Lincoln City) wins a free kick in the attacking half. Tyler Walker (Mansfield Town) wins a free kick on the left wing. Krystian Pearce (Mansfield Town) wins a free kick in the attacking half. Attempt saved. Krystian Pearce (Mansfield Town) header from the centre of the box is saved in the bottom right corner. Hand ball by Tom Pett (Lincoln City). Attempt missed. Jacob Mellis (Mansfield Town) right footed shot from outside the box misses to the left. Goal! Mansfield Town 1, Lincoln City 1. John Akinde (Lincoln City) converts the penalty with a right footed shot to the bottom right corner. Penalty conceded by Conrad Logan (Mansfield Town) after a foul in the penalty area. Penalty Lincoln City. Harry Anderson draws a foul in the penalty area. Corner, Lincoln City. Conceded by Conrad Logan. Tom Pett (Lincoln City) wins a free kick in the defensive half. Attempt missed. Bruno Andrade (Lincoln City) right footed shot from outside the box is close, but misses to the left. Corner, Mansfield Town. Conceded by Harry Toffolo. Corner, Mansfield Town. Conceded by Neal Eardley. Attempt missed. Tyler Walker (Mansfield Town) right footed shot from the centre of the box is high and wide to the left. Jacob Mellis (Mansfield Town) wins a free kick in the defensive half. Substitution, Mansfield Town. Alexander MacDonald replaces Jorge Grant.